Arthopper.org, a project of the Foundation for New Creative Projects, seeks to provide high quality arts journalism in the Greater Lake Erie region in specific cities including Cleveland, Columbus, Akron, Cincinnati, Dayton, Detroit, Pittsburgh, Toledo, and Youngstown. Covering visual arts events through reviews of exhibitions, interviews of artists, essays, opinion pieces and critical discourse, Arthopper.org provides an engaging community asset that educates the public, fosters critical thinking, provokes conversations, and contributes to an overall better quality of life for the citizens of the region. Funding for Arthopper.org is provided by generous sponsorship support from the Cleveland Institute of Art, generous foundation support from the George Gund Foundation and generous public sector support from the Ohio Arts Council. Ron Scott is a pseudonym for the writer Ron Teachworth who covers the Detroit metropolitan area for the web site. Susanne Hilberry opened her gallery in September of 2002 with a Richard Artschwager exhibit and now, ten years later, she returns to his work with a new exhibition that opened March 24, 2012. To view the work, one has to place Artschwager in context: an artist who first appeared on the art scene in New York City fifty years ago, whose work fits into a place somewhere between Pop Art and Minimalism. This new exhibit includes a mix of minimalist sculpture, banal naïve drawings, and floating figures made of horsehair. Artschwager’s boxy sculptures present a reductive geometry that mimics everyday objects. He seems to want to continually experiment, not just with a multitude of ideas, but also with a large and sweeping field of materials that include glass, wood, plastic bristles, Formica, mirrors and clock works. In this exhibit, these objects are juxtaposed to a collection of drawings in charcoal and a variety print media that seem rather ordinary in nature. Born in 1923, he studied at Cornell University, and left to serve in the military during World War II, before returning to make furniture. When a fire destroyed his studio in 1968, he made a decision to make art that questioned the line between art and utility, while at the same time, he leisurely passed through the genres of the time, continually investigating the illusion of perception. 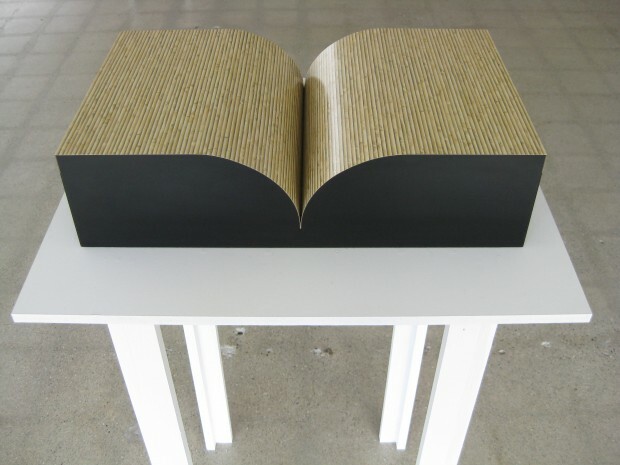 The Book is a sculpture that uses the form of an open book as its subject, and rather elegantly appeals to ones senses in spite of the reference. The interior top of the object is Formica that photographically replicates bamboo. The piece likens us back to the Dada movement but without the politics and ridicule, where objects were use as a form of protest. Artschwager is not protesting, but living inside his own personal world of ideas that has been shaped by his experience. The drawings and prints in this exhibit feel like a counter balance to his more experimental or even surreal ideas, as if they keep him grounded in his earlier years of art study. The atmospheric landscapes, and scrolling tangles, scratchy lines and marks, are reminiscent of Milton Avery. The charcoal drawing of a crouching figure could be a self-portrait that he chooses not to reveal. 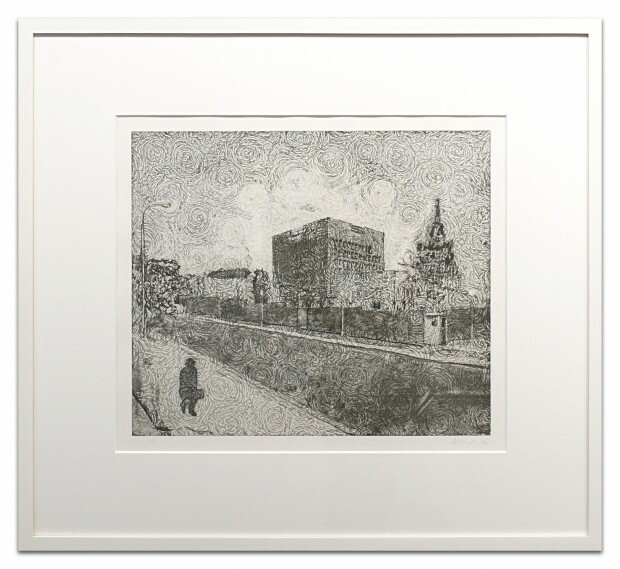 Richard Artschwager takes us in a variety of directions, and gives the viewer glimpses into his sophisticated world that is visually and conceptually compelling.